Coming off a sore shoulder Jeff Hearron wasn't even sure he was going to start that game in May 1986, The Toledo Blade wrote. He not only played, he hit a home run. And it won the game. "I was actually trying for the homer on the two swings prior to that," Hearron told The Blade. "Once it went to 3-2, I was just trying to hit the ball hard, but take a natural swing." Hearron was playing at AAA after spending his first six games in the majors the year before and 11 more games with the Blue Jays that April. His major league career would end that September, with one more appearance, Sept. 28. Hearron joined the Blue Jays system in 1983, taken in the fourth round of the draft out of the University of Texas. With Texas, Hearron helped the Longhorns win the College World Series in 1983. One of the pitchers Hearron caught with that Texas team was future Blue Jay pitcher Roger Clemens. With the Blue Jays system, the catcher started at single-A Florence in 1983, hitting .285 with five home runs. He moved up to AA Knoxville in 1984, returning there for 1985. He hit .250 and then .223 respectively at AA. Hearron made the jump to Toronto in August 1985, and a late signing helped him see time that year in the American League Championship Series. The Blue Jays signed a more-experienced back-up catcher hours past the playoff roster deadline, leaving Hearron as the Ernie Whitt backup. By that time, Hearron had been in only two major league games. Blue Jays Manager Bobby Cox told The Montreal Gazette in mid-September he expected to give Hearron more playing time when the Toronto lead was bigger. Hearron got into two more games, Sept. 29 and Oct. 6, getting his first major league hit Sept. 29. That October, Hearron got into two of the Blue Jays playoff games, both times as a defensive replacement and not getting to bat. Returning for 1986, Hearron was again Whitt's backup, or at least he was the catcher called up when Whitt went down in mid-April with back spasms. In 12 games, Hearron got five hits in 23 at bats. On April 19, Hearron went 2 for 3, scoring on a Lloyd Moseby home run. Sent back down to AAA Syracuse in time for that game-winning home run against Toledo in May. Hearron's final appearance came Sept. 28, 1986, going 0 for 1 in a 12-3 loss to the Red Sox. Hearron played two more seasons in the Blue Jays system, going back to AA Knoxville in 1987, then further down to single-A Myrtle Beach in 1988. 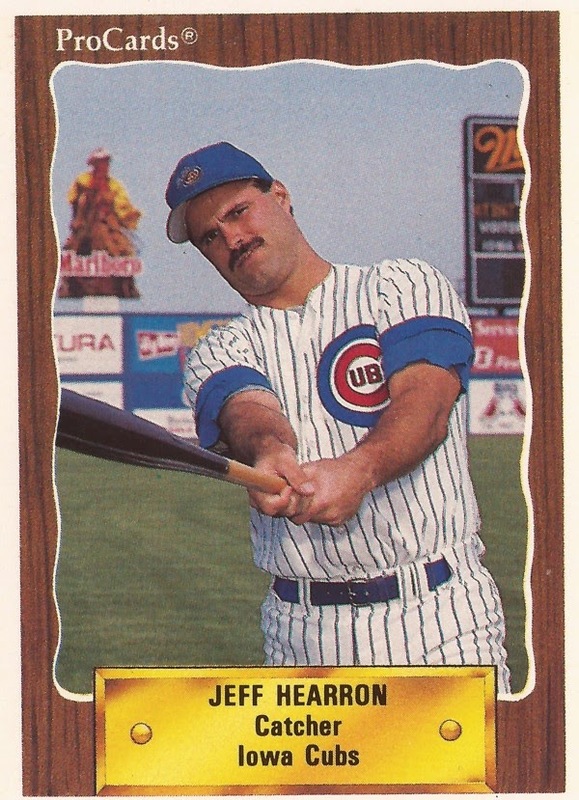 Moving on to the Padres system for 1989, Hearron played 55 games at AAA Las Vegas. The next year, Hearron's final year playing, he caught at AAA Iowa with the Cubs. After his season with the Padres system, Hearron served as a baseball ambassador of sorts. In January 1990, according to The Milwaukee Journal, Hearron was named to a team of U.S. players running baseball clinics in the Soviet Union, invited there by the Soviet Baseball Federation.